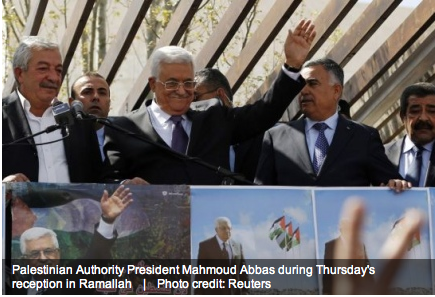 Palestinian Authority President Mahmoud Abbas returns from visit to United States, tells Fatah supporters in Ramallah Palestinian people “will not give up one inch of land” • “I have honored my pledge. … Be assured that we will be victorious,” he says. Palestinian Authority President Mahmoud Abbas returned from his visit to the United States on Thursday and told Fatah supporters that the Palestinian leadership “won’t give in” to American pressure regarding the Israeli-Palestinian peace process. “I have honored my pledge and kept my promise. We … will uphold our principles. You are aware of all the conditions and the pressures, but I repeat: We will not give in,” Abbas pledged before thousands of Fatah supporters attending an official reception held in Ramallah in his honor. The leadership of the Jewish advocacy group the AMCHA Initiative, will testify on Friday, March 21, before a California Assembly Select Committee on Campus Climate. AMCHA Initiative will be urging members of the state committee to examine campus antisemitism and to take the proper steps to ensure Jewish students feel safe and welcome at California’s colleges and universities. “Unfortunately, antisemitism at U.S. colleges, and, especially, in California, is growing at an alarming rate,” stated Tammi Rossman-Benjamin, a UC professor and AMCHA Initiative cofounder. “Students have reported to us that they feel uncomfortable speaking freely about their support for Israel and have felt unsafe at times in their classrooms and on campus because they are Jewish,” explained Leila Beckwith, a UC professor and AMCHA Initiative cofounder. Assembly Speaker John Perez (D-Los Angeles) announced the creation of the Select Committee in January. March 21 is the first of four public hearings the Committee will hold over the next few months. The Committee was tasked with investigating issues pertaining to student welfare on college campuses. Assemblymember Shirley Weber (D-San Diego), who worked as a San Diego State University professor, chairs the Committee. • UC Davis, February 2012: Students for Justice in Palestine interrupted, heckled and physically threatened speakers at a pro-Israel event, causing it to be shutdown. The attendees reported fearing for their safety at the event and for weeks after. • UC Davis, November 2012: Forty protestors blocked Jewish students from entering a university administrative building and bullied and harassed Jewish students who slipped through the blockade. 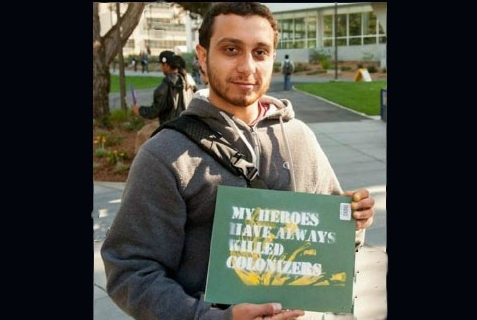 • San Francisco State University, November 2013: General Union of Palestine Students (GUPS), hosted an event where participants could make posters that said, “My Heroes Have Always Killed Colonizers,” referring to Jews, as well as posters of the convicted hijacker Leila Khaled holding a gun. Leila Khaled is a member of the State-Department designated terrorist group, the PFLP, which is responsible for 159 violent terrorist acts. • UC Davis, UCLA and UC Riverside, January 2014: Three University of California campuses hosted known anti-Semitic speaker Omar Barghouti. At the events, Barghouti spewed classic anti-Semitic rhetoric and lies. • San Francisco State University, March 2014: Professors hosted an official department event to inform students about a recent Middle East trip where they met with multiple individuals affiliated with US State Department-designated terrorist organizations responsible for the murder of numerous Jews worldwide. “As you embark on your important task, we hope that you will make the issue of antisemitism at California colleges and universities part of your agenda and ensure California’s campuses are safe and welcoming environments for Jewish students,” wrote Rossman-Benjamin in her remarks. AMCHA Initiative is a non-profit organization dedicated to investigating, documenting, educating about, and combating antisemitism at institutions of higher education in America. Last week, approximately 600 Christians descended on Bethlehem to attend the 2014 Christ at the Checkpoint Conference organized by Bethlehem Bible College. The organizers and presenters of this conference say that they want to promote peace between Israel and the Palestinians, but they just cannot stop themselves from engaging in an ugly propaganda war against the Jewish state. In other words, they cannot refrain from lying about Israel, repeatedly and shamelessly. Three times during the conference, attendees were told that Israel has constructed a security barrier that completely surrounds the city of Bethlehem. Two people called it a wall and a third described it as a wall and fences. No matter how they describe it, the security barrier, which was constructed to stop terrorists from crossing from the West Bank into Israel, does not surround the city. Even the map of the West Bank provided in the program for Christ at the Checkpoint shows this. The eastern and southern sections of the city are not confined by a wall. Nevertheless, on the first night of the conference, Bethlehem Mayor Vera Baboun said the city is “surrounded with a wall.” I was in the audience when she said this and there were Palestinian Christians sitting next to me who didn’t bat an eye after hearing this lie. This was not an honest mistake. Baboun is the mayor of the city, for heaven’s sake. We all know politicians lie, but this is a bit much. Mayor, will you please stop lying? Again, I was in the audience when this film was shown and no one in the audience voiced a word of objection. Not one word. And again, this was not an honest mistake, for Shomali lives in nearby Beit Sahour. He knows that Bethlehem is not surrounded by a wall. Professor, will you please stop lying? I was not in the room when the film was shown, but it is on Youtube, right here. It goes without saying, (but has to be said), this was not an honest mistake. Holy Land Trust is headquartered in Bethlehem. Awad works in the city. He knows the route of the barrier. Sami, will you please stop lying? Probably not. This is not the first time Awad has uttered this falsehood. He said it to an audience of Christians in Galveston, Texas, in 2009. He was called out on it in a piece published on CAMERA’s website in 2012. And yet he said it again two years later. Did he expect not to get caught? The upshot is this: Three different people offered the same lie to an audience comprised mostly of Evangelical Protestants from the United States and Europe. They told people that the city in which they were currently staying was surrounded by a security barrier, when in fact it isn’t. This lie has been repeated so many times it is astounding. Sami Awad’s father, Bishara, offered repeated this lie in a fundraising video produced in 2007 or 2008. It was repeated by 60 Minutes reporter Bob Simon in a notoriously dishonest segment that aired in 2012. The show hasn’t corrected. It was repeated by Simon’s boss, CBS News Chairman Jeff Fager at a talk he gave at St. Mark’s Church in New Canaan, Connecticut, one year later. Fager said he would “look into” the issue, but like I said, the show hasn’t corrected. This lie was offered by former Lutheran Bishop Margaret Payne on a radio show in 2009. She refused to retract. And in 2013, after the lie was debunked numerous times, Gary Burge offered his own version of this lie in the “new and revised” edition of his error-laden book, Whose Land? Whose Promise? This lie, as easily exposed as it is, is unbelievably resilient. It has been repeatedly debunked. And yet people keep repeating it or refuse to retract it even after they’ve been given overwhelming evidence that what they’ve said is not true. And people have seen others called out on the lie, and yet they repeat it themselves. Why? Why not invoke Qalqilya – a place in the West Bank where numerous suicide attacks were launched from? For people indifferent to Qalqilya’s history as a source of terror attacks during the Second Intifada (like many of the folks at Christ at the Checkpoint), images of this city would be very compelling. Why lie about Bethlehem? Simple. 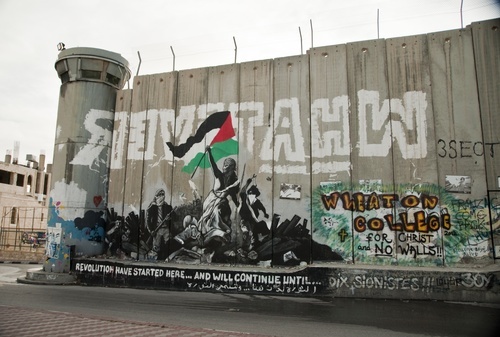 The lie that the Israelis have built a wall that completely surrounds Bethlehem confirms people’s theological understanding of Jew as enemies of God and of humanity itself. People want proof for this belief and this lie gives it to them, the facts be damned. Bethlehem, you see, is the city of Jesus’ birth. And in the Christian world view, when Israel strangles the city of Bethlehem with a wall, it is akin to constricting God Himself. It’s no mistake that speakers at the Christ at the Checkpoint Conference kept reminding attendees that Jesus was born in Bethlehem, just a few minutes from the hotel where the confab was being held. And it’s no mistake that other speakers kept telling the Christians in the audience that Israel had built a wall around this city. It’s a simple lie, but not an innocuous one. It’s part of a hateful message. When coupled with scripture and theology, this lie offers a very evil message about the Jewish people and their homeland. People who repeat this lie, as so many people have, are not merely purveyors of misinformation. They are broadcasters of hate. Dexter Van Zile (@dextervanzile) is Christian Media Analyst for the Committee for Accuracy in Middle East Reporting in America (@cameraorg). He attended the Christ at the Checkpoint Conference that took place in Bethlehem on March 10-14, 2014. Organizer of a World War II-themed party apologizes after a photo of the event provoked outrage on the Internet. The organizer of a World War II-themed party that included Nazi flags and men in SS uniforms apologized on Wednesday after a photo of the event in Minneapolis provoked outrage on the Internet, reports The Associated Press (AP). The Nazi-themed party, which was held at Gasthof zur Gemutlichkeit, a popular German restaurant and bar in northeast Minneapolis, was condemned by the Jewish Community Relations Council of Minnesota and the Dakotas (JCRC). 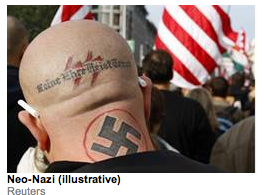 The dinner also featured Nazi banners which hung on the walls of the German restaurant. The dinner was held back in January but only came to light this week when a photo from the party was first posted online by the alternative weekly City Pages, reported AP. Boorom also said members of the re-enactment groups are given extensive background checks and no neo-Nazis are allowed to participate. He also insisted they’re not there because they “believe in what Hitler stood for,” but rather, to educate those that take part in the events. “We are a historical re-enactment and professional actor society dedicated to promoting understanding of World War II. In no way are we or any of our members affiliated with groups that promote the subjugation of anyone,” the statement read. Mario Pierzchalski, owner of the restaurant where the party was held, told the Star Tribune he has hosted the party for six years but will not do so again. 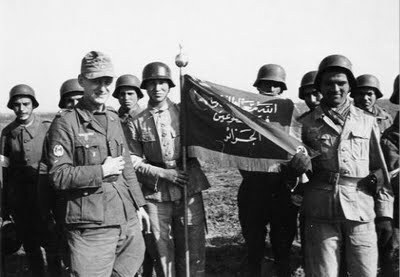 He defended the partygoers, who included men dressed as Italian soldiers and one as an American soldier.